what you want to see - will not. Created with a unique aspheric center-near design for the presbyopic eye, 1-DAY ACUVUE® MOIST Brand MULTIFOCAL is the FIRST AND ONLY contact lens optimized to address the natural variation in pupil size according to age and refractive power for a superior vision experience. Experience clear vision; near, intermediate, and far, in dim light and bright so you can continue wearing contact lenses to do the things you love. And because they’re built on the 1-DAY ACUVUE® MOIST platform, you’ll get the same comfort and convenience you expect, for many years to come. 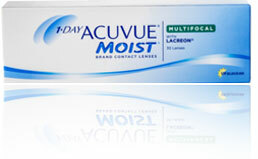 The only multifocal contact lens that matches the optical design to the pupil size, with 183 unique designs engineered according to age and refractive error Designed to be comfortable for the presbyopic eye, and with an optimized, predictable fit, 1-DAY ACUVUE® MOIST Brand MULTIFOCAL is able to deliver excellent vision.